Bologna-bound: Il cinema ritrovato 2018 | Silents, Please! In less than two weeks, the magnificent film festival Il cinema ritrovato (‘Cinema rediscovered’) kicks off in Bologna, Italy. And yes, I’m going to be there! This will be my second time attending Il cinema ritrovato. I had a blast at the festival when I attended in 2016, and I’m thrilled to be returning. It’s probably the last time I’ll visit Europe for some years—living in such a remote part of the world as I do, international travel like this is a big deal for me, logistically, financially, and time-wise—so I will be making this holiday count! So, what’s on the agenda for Cinema ritrovato? Although all of the details of the lineup are not finalised until shortly before the festival begins, a lot of information about the programme is on the festival website. There is a healthy presence of female filmmakers in the programme. I’m absolutely thrilled to see a section devoted to Elvira Notari, the very successful Neapolitan director. Her films are much discussed in books and scholarship, but very difficult to see outside the archives. Even better, this section of the programme even includes a carbon-arc screening of several of her films! Other female filmmakers represnted are Ella Bergmann-Michel, a German pre-Bauhaus visual artis, and Cécile Decugis, editor and filmmaker; I’m not familiar with either, but looking forward to seeing some of their work. The section The Rebirth of Chinese Cinema, 1941-1951 looks great. I have seen a bunch of Chinese silents (and more recent films), but nothing from this era, even big name films like Spring in a Small Town (CN 1951). This will be really interesting! And speaking of Chinese (or rather Chinese diasporic) cinema, several King Hu films have been restored and shown in festivals in recent years—I missed 俠女 | A Touch of Zen (1971) when it showed locally a year or two ago, and I’ve regretted that since. Sadly for this wuxia fan, it doesn’t look like we’ll see any King Hu in Bologna. In terms of silents, the Cento anni fa section contains films by Feuillade, Chaplin, Vladimir Mayakovsky and others, alongside familiar titles. Powerhouse Turinese studio Ambrosio is represented in the programme Arrigo Frusta and the Writing Workshop. The selection of outdoor screenings in the Piazza Maggiore is heavy on classic films that I’ve never got around to watching: 7th Heaven (US 1927), Gilda (US 1946) by Charles Vidor, Ladri di biciclette | Bicycle Thieves (IT 1948), The Earrings of Madame de … (FR 1953), The Deer Hunter (US 1978). 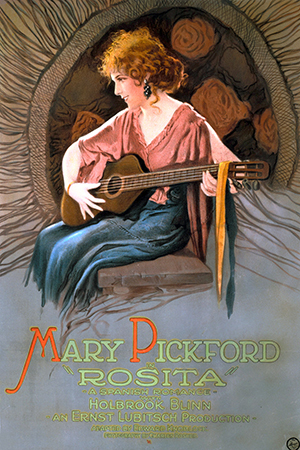 I’m also excited to see Rosita (US 1923), the legendary collaboration between Mary Pickford and Ernst Lubitsch, in the lineup. This one has been doing the film festival rounds in the last while, so I was hoping it would be screened at Il cinema ritrovato. There’s so much on display that this preview doesn’t even really scratch the surface. It’s going to be a hell of a week! Look out for a review post at some point following the festival. This entry was posted in Film festivals and tagged Il Cinema Ritrovato. Bookmark the permalink. Oh shoot! I’m missing it (and meeting you) again! One of these years, I will make it to this. Have a great time! Just wanted to say that I just discovered your incredible blog thanks to the post about Melies and movies from outer space, and this is just a delight. I’ve always been a lover for old and silent films since my childhood, and I am so happy to read you. Wishing you all the best and will keep an eye here. Keep doing the good job.